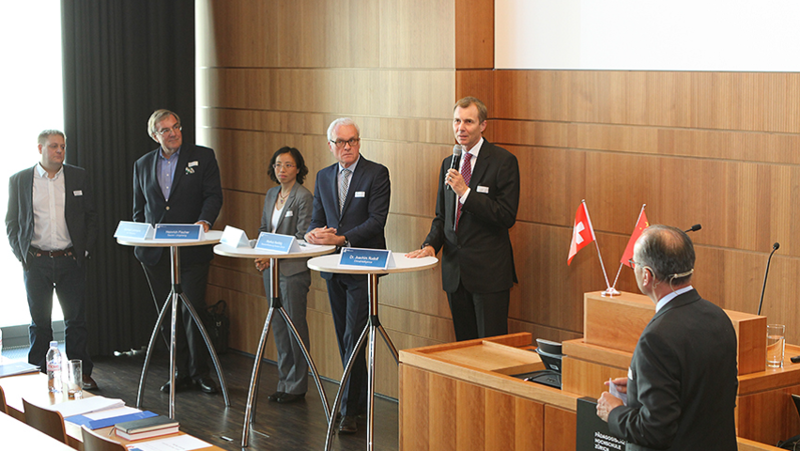 On September 5th, 2016 Michael Lehmann was invited by the Zürich University of Applied Sciences to participate in a Conference about Chinese investment in Switzerland. Organized by the Division Banking, Finance, Insurance of the School of Management and Law under Prof. Dr. Suzanne Ziegler and Professor Markus Braun, the event was a great success with over 80 participants. The core questions of the conference were to understand how Chinese companies plan mergers or acquisitions of Swiss Companies and Brands / which of the latter are most interesting for Chinese Investors / how do Chinese companies organize the integration and whether or not Switzerland has to be careful in view of the Chinese investment wave for certain key-industries to remain Swiss. While Dr. Joachim Rudolf has shown a detailed picture of the most influential private and state-owned Chinese Companies, Mr Markus Assfalg location promotion Zürich and Mr. Heinrich Fischer, former Chairman of Saurer/Jingsheng have talked about their concrete experience, on Swiss and on Chinese side. Dr Markus Braun elaborated on the process of such acquisitions and Juan Wu stated the attractions of Swiss Brands and technologies in the spotlight. Michael Lehmann explained the importance of the Chinese market itself in such ventures and listed the driving forces of such undertakings. The active Q&A session showed clearly the interest of the audience, as did the presence of a representative of the Chinese Consulate in Zürich. The subsequent networking cocktail offered a great platform for speakers and participants to mingle and exchange their views.